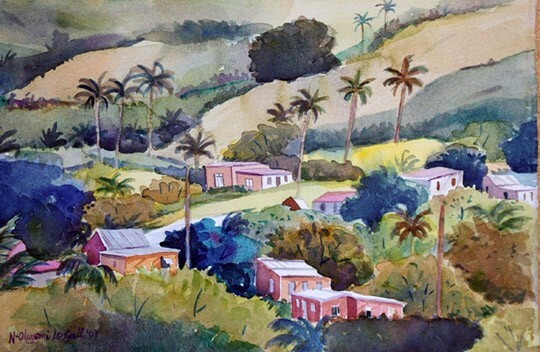 ART EXHIBITION FEATURING CARIBBEAN ARTISTS SAT. MAY 4TH BROOKLYN NY | STREETS OF NEW YORK 411 INC.
New York, NY – Diaspora Now Inc, in association with Phillip Benn will present paintings, prints, and sculptures by Barbadian artists Victor Collector, Carlton Murrell, and Alfred Weekes at the opening weekend of the new multi-purpose facility on Saturday May 4th at 1070, Nostrand Avenue, Brooklyn NY 11225. This FREE Art Exhibition will begin 2PM until Midnight. Diaspora-Now was formed in 1986 by Barbadian American entrepreneurs Anderson M. Pilgrim and Adrian O. Myles. Our primary mission is to increase awareness and appreciation of Caribbean culture through the distribution of information and through works of art. Victor Collector has been painting since the late 1980’s, and specializes in realistic oil and watercolor paintings of seascapes, landscapes, and traditional Barbadian chattel houses. Victor’s award winning paintings have been exhibited in the USA at the Hotel Continental, Miami, FL; the OAS Gallery, Washington, DC; as well as the Caribbean’s premier arts festival, CARIFESTA V, held in Trinidad and Tobago. His work is frequently exhibited in Barbados’ most prominent art galleries and commissioned by discerning collectors from all over the world. Carlton Murrell began his painting career at 18, inspired by the landscape of his native Barbados. Murrell later migrated to the Capital City of Art – New York and was awarded a scholarship to pursue advanced studies at the Art Students League. He later attended the Pan American School of Fine Art and Pel’s School of Commercial Art and Illustration. He has exhibited in museums and educational institutions, as well as numerous galleries throughout the United States. His works hang in permanent collections of Carver Federal Savings Bank, the Copper Corporation of Chile, South America, Howard University, and the Central Bank of Barbados. Mr. Murrell has received numerous awards, prizes and citations. Alfred Weekes has been creating wire sculptures since the 1970s and his work has been exhibited widely throughout the Caribbean and North America. In 1993 Mr. Weekes was judged BEST IN SHOW at the 1993 Manchester Art Association show in Manchester, Connecticut. In August 1998, Mr. Weekes’ first one-man exhibition, “In Person”, consisting entirely of colorful relief sculptures, received critical acclaim at Brooklyn Moon Café in New York City. His technique has continued to evolve and his sculpture has become almost painterly in rendition. Mr. Weekes’ work is held in private collections throughout the Caribbean, Europe, and the U.S.